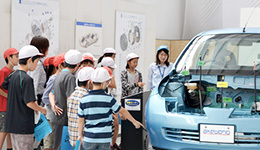 Nurturing Human Resources Capable of Strengthening the Frontlines | With Our Associates and Their Families | Stakeholders | Corporate Social Responsibility (CSR) | Akebono Brake Industry Co., Ltd.
Akebono demonstrates its unique manufacturing capabilities at all of its locations throughout the world. 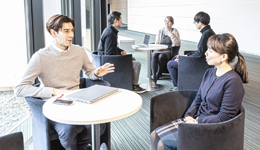 Akebono is working to nurture human resources capable of strengthening the frontlines by teaching associates the fundamental philosophy and principles of manufacturing at the Monozukuri Center, which was launched in 2011. Guided by the concept of “nurturing people who can think independently, analyze problems, propose solutions and implement them” this training facility provides manufacturing training and education to any associate, anytime, in a short period. 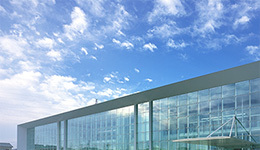 The Monozukuri Center has three functions: Monozukuri Dojo, which aims to provide associates with knowledge based on first-hand experience that they can take back to their respective production frontlines; Fundamental Skills Training School, which seeks to spread and instill optimal standard work procedures among associates; and Otehon Line (Ideal Line), which presents best practices for production processes. 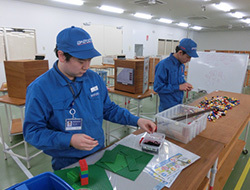 The training courses use educational materials prepared by the instructors themselves, thereby fulfilling a pivotal role in communicating Akebono’s unique manufacturing capabilities to associates. From fiscal 2015, Akebono has opened Monozokuri Dojos at various domestic production sites, and the initiative has expanded to overseas locations in 2017 with new Dojos opening and training commencing in Thailand, France, and Slovakia. On a cumulative basis from the opening of the Monozukuri Center to the end of fiscal 2017, Akebono had opened 18 Monozukuri Dojos at production sites worldwide, and 11,883 associates had completed the training courses (with about 40% completing the training courses in Japan and the remaining 60% completing the training courses overseas). Of this total, 530 associates completed training courses domestically in fiscal 2017. In terms of the composition of the training courses, Monozokuri Dojo accounted for 78% of the training courses, while Fundamental Skills Training School accounted for the remaining 22%. 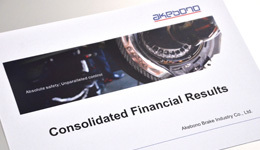 From fiscal 2017, Akebono has also been focusing on nurturing the trainers who will actually lead the training courses, in order to expand the reach of the training courses and education. Currently, 32 trainers are conducting training courses on a daily basis around the world. In 2018 we continue to accelerate progress in the same programs. 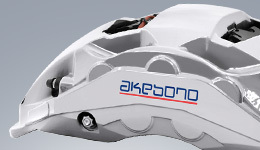 Going forward, Akebono will undertake measures to implement its unique manufacturing capabilities at production sites according to local conditions and needs. Concurrently, Akebono will drive the evolution of its activities by nurturing trainers further and honing their abilities while continuously reviewing the Dojos and revising the training curriculum. 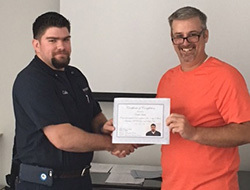 Presentation of Certification of Completion for Training Course in the U.S.